New Delhi: One of the four districts of the Union Territory of Puducherry – Mahe has been declared open defecation free. Lt Governor Kiran Bedi on Twitter acknowledged the authorities, civic bodies and residents of Mahe for the ODF achievement. “Congratulations to Manickadeepan, Regional Administrator and residents of MAHE, Puducherry for making #Swachh and #ODF free,” said Kiran Bedi. The efforts are being made by the authorities to make the entire region of Puducherry Open Defecation Free by October 2 this year. Mahe, a town with more than 41,000 people has emerged as the first region to establish this record. In Puducherry, the Swachh Bharat Abhiyan is being implemented expeditiously. 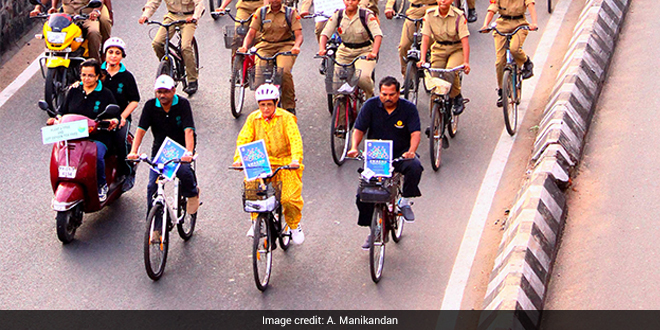 From organising Cycle Rallies to holding Cleanliness shramdaan, Puducherry is doing it all with an aim to make the region clean and swachh. Kiran Bedi, herself has been visiting various pockets in and around Puducherry, every Saturday and Sunday to implement the Swachh Bharat Abhiyan. Recently, Kiran Bedi visited Karaikal to ensure proper implementation of the Swachh Bharat programme. In order to achieve the Clean India status by 2019, the Government has set a target for the 300 districts of the country to go ODF by December 2017 and for the 7 Union Territories, the target to go ODF is March 2018.